The 'N-Squared Diagram' is not composed of special diagram constructs. In fact, an 'N-Squared Diagram' can be generated by Innoslate on the fly based on the current contents of your project’s database. The 'N-Squared Diagram' is built using entities in the database of the 'Action' and 'Input/Output' classes. The actions display as blocks within the matrix, and the I/Os show as text within the matrix. Viewing N-Squared Diagrams You can 'View a N-Squared Diagram’ of any new or existing entity of the Action class via the 'Open' drop-down menu, where available. Adding an Entity An entity can be added to an ‘N-Squared Diagram’ via drag-and-drop. The ‘N-Squared Diagram’ is not composed of special diagram constructs. In fact, an ‘N-Squared Diagram’ can be generated by Innoslate on the fly based on the current contents of your project’s database. The ‘N-Squared Diagram’ is built using entities in the database of the ‘Action’ and ‘Input/Output’ classes. The actions display as blocks within the matrix, and the I/Os show as text within the matrix. 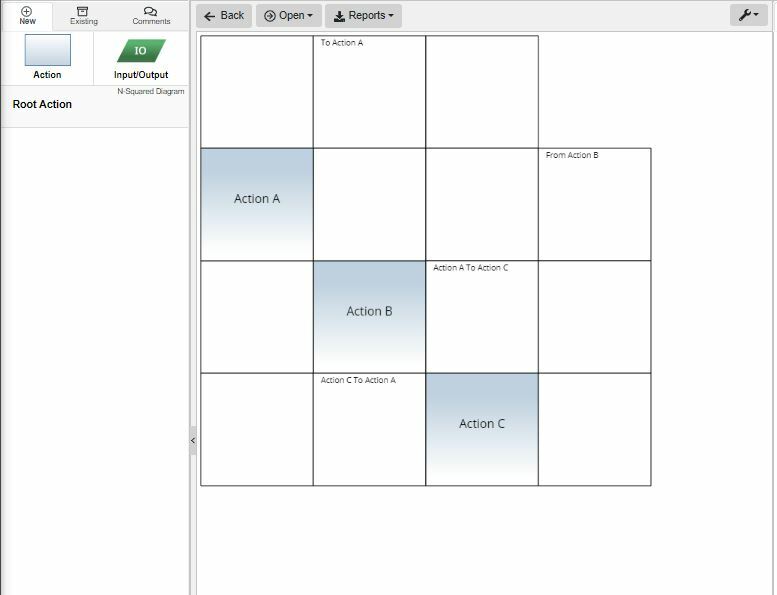 Viewing N-Squared Diagrams You can ‘View a N-Squared Diagram’ of any new or existing entity of the Action class via the ‘Open’ drop-down menu, where available.